LOS ANGELES — Tyson Fury appeared to be out cold on the canvas after eating a right hand and a crushing left hook from WBC heavyweight champion Deontay Wilder in the 12th round. But like o'l Adonis Creed, Fury had no quit in him. At the count of six, Fury, who stands at 6'9" 256 pounds, rose to his feet. Three years ago, Fury (27-0-1, 19 KO's), 30, was a three-belt unified world titleholder after he shocked the world with a lopsided unanimous decision over Wladimir Klitschko, but the celebration was short-lived, as his entire world came crashing down on him. He subsequently battled depression and substance abuse problems. In his worst state, Fury was nearly 400 pounds. But on Saturday at Staples Center in Los Angeles, Fury's mind told him 'You didn't come this far just to lay down, not even to the most dangerous puncher in the sport.' Fury did not just get up, he came back and rocked Wilder (40-0-1, 39 KO's) late as they battled to the end in a classic heavyweight battle before 17,698 fans, but the bout was ruled a controversial split draw. Judge Alejandro Rochin turned in an eyebrow-raising scorecard of 115-111 for Wilder, Robert Tapper had it 114-112 for Fury, and Phil Edwards scored it 113-113 -- even. FightNights.com concurred with Tapper, giving Fury a 114-112 score. 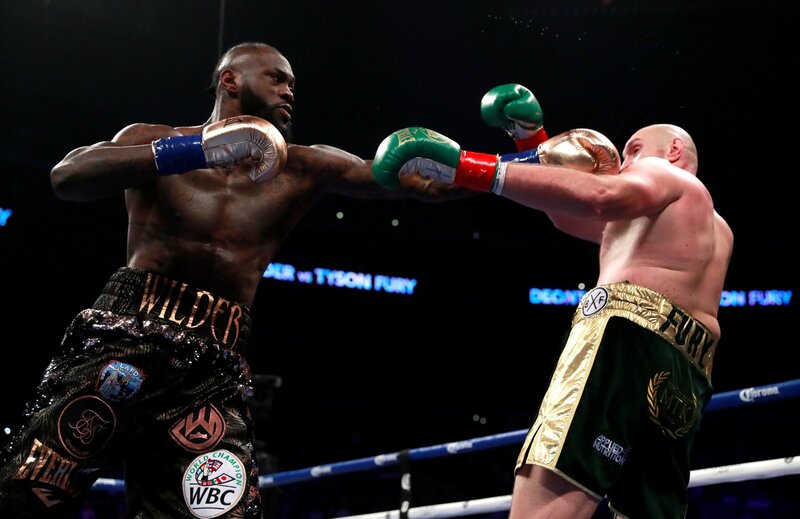 Wilder may have kept his title and exhibited so savagely why he is called the "Bronze Bomber," but it was Fury who controlled most of the fight. “We’re on away soil, I got knocked down twice, but I still believe I won that fight,” said Fury. “The world knows I won the fight. I hope I did you all proud after nearly three years out of the ring. I was never going to be knocked down tonight. I showed good heart to get up. I came here tonight and I fought my heart out. "I enjoyed every second of it. I’m not gonna sit here and complain all night, scream robbery. I thought I won the fight.," Fury said at the post-fight press conference. "